^ Goode, Lauren (June 17, 2011). "Worth It? An App to Get a Cab". The Wall Street Journal. ^ Bensinger, Greg (February 9, 2017). "Uber Taps Zipcar to Put More Drivers on the Road". The Wall Street Journal. ^ Wells, Georgia; MacMillan, Douglas (April 15, 2016). "Uber, Lyft Drivers Need Business Licenses to Operate in San Francisco". The Wall Street Journal. ISSN 0099-9660. ^ Schechner, Sam (November 13, 2014). "Uber Launches Car Pooling Service in Paris". The Wall Street Journal. ^ Bensinger, Greg (March 27, 2017). "Uber Resumes Self-Driving-Vehicle Program After Arizona Accident". The Wall Street Journal. ^ Wakabayashi, Daisuke (March 23, 2018). "Uber's Self-Driving Cars Were Struggling Before Arizona Crash". The New York Times. ^ Griswold, Alison; Griswold, Alison. "Uber raised $1 billion for self-driving cars because it desperately needs the money". Quartz. Retrieved April 22, 2019. ^ Isaac, Mike (November 20, 2017). "Uber Strikes Deal With Volvo to Bring Self-Driving Cars to Its Network". The New York Times. ^ Isaac, Mike; Wakabayashi, Daisuke (February 24, 2017). "A Lawsuit Against Uber Highlights the Rush to Conquer Driverless Cars". The New York Times. ^ Saitto, Serena (January 21, 2015). "Uber Raises $1.6 billion in Convertible Debt to Expand". Bloomberg News. ^ MacMillan, Douglas; Demos, Telis (May 9, 2015). "Uber Eyes $50 Billion Valuation in New Funding". The Wall Street Journal. ^ MacMillan, Douglas (May 25, 2016). "Toyota and Uber Reach Investment, Lease Partnership". The Wall Street Journal. ^ Isaac, Mike; de la Merced, Michael J. (June 1, 2016). "Uber Turns to Saudi Arabia for $3.5 billion cash infusion". The New York Times. ^ MacMillan, Douglas (July 7, 2016). "Uber Raises $1.15 billion From First Leveraged Loan". The Wall Street Journal. ^ Bensinger, Greg; Dawson, Chester (August 27, 2018). "Toyota Investing $500 Million in Uber in Driverless-Car Pact". The Wall Street Journal. ^ Issac, Mike (August 26, 2016). "How Uber Lost More Than $1 Billion in the First Half of 2016". The New York Times. ^ Grandoni, Dino (August 2, 2015). "Political Consultant for Uber to Advise Other Start-Ups". The New York Times. ^ Isaac, Mike (April 11, 2017). "Executive Who Steered Uber Through Scandals Joins Exodus". The New York Times. ^ Conger, Kate (August 21, 2018). "Uber Appoints New Head of Finance as It Marches Toward an I.P.O.". The New York Times. ^ Berger, Paul; Gottfried, Miriam (January 17, 2018). "Hedge Fund Bets on Beaten-Up New York Taxi Business". The Wall Street Journal. ^ Newcomer, Eric (May 15, 2017). "Uber Starts Charging What It Thinks You're Willing to Pay". Bloomberg News. ^ Fitzsimmons, Emma G.; Hu, Winnie (March 6, 2017). "The Downside of Ride-Hailing: More New York City Gridlock". The New York Times. ISSN 0362-4331. ^ Badger, Emily (October 16, 2017). "Is Uber Helping or Hurting Mass Transit?". The New York Times. ^ Huet, Ellen (January 19, 2017). "Uber to Pay $20 Million to Settle FTC Suit Over Driver Pay". Bloomberg News. ^ Isaac, Mike (January 31, 2017). "What You Need to Know About #DeleteUber". The New York Times. ^ Walker, Edward T. (August 7, 2015). "The Uber-ization of Activism". The New York Times. ^ MacMillan, Douglas; FLEISHER, LISA (January 29, 2015). "How Sharp-Elbowed Uber Is Trying to Make Nice". The Wall Street Journal. ^ Timberg, Craig; Fung, Brian (March 3, 2017). "Uber's secret 'Greyball' program shows just how far it will go to get its way". Chicago Tribune. ^ Issac, Mike (November 19, 2014). "Uber's Privacy Practices Questioned by Senator Franken". The New York Times. ^ Timberg, Craig (December 1, 2014). 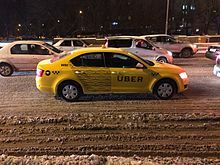 "Is Uber's rider database a sitting duck for hackers?". The Washington Post. ^ "Uber Paid Hackers to Delete Stolen Data on 57 Million People". Bloomberg News. November 21, 2017. ^ Isaac, Mike (February 22, 2017). "Inside Uber's Aggressive, Unrestrained Workplace Culture". The New York Times. ^ Isaac, Mike (February 27, 2017). "Amit Singhal, Uber Executive Linked to Old Harassment Claim, Resigns". The New York Times. ^ Bensinger, Greg (June 13, 2017). "Uber CEO Travis Kalanick to Take Leave of Absence". The Wall Street Journal. ^ Isaac, Mike (June 21, 2017). "Uber Founder Travis Kalanick Resigns as C.E.O.". The New York Times.